It’s been an interesting summer so far. There’s a lot of media floating around right now: movies, TV shows, and games. I’ve been scanning titles on Netflix, checking the movie listings, reading about the new games announced at E3, and I’m feeling a bit dispirited. 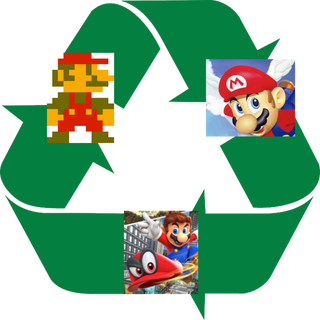 There’s a whole lot of recycling going on. There are some Breath of the Wild spoilers in this article. They only relate to the story and the ending, which, I will say, are very predictable anyway. When I say recycling I mean that I keep seeing the same products coming up again and again, just with some modifications, upgrades. The word “new” keeps getting used but it’s starting to seem inappropriate. I see something like “New Star Wars movie.” “New Full House episodes.” “New Pokemon game.” But these formats, they’re kinda old, right? Star Wars started before I was born. Full House, can’t even remember it because I didn’t watch it when I was young. I can remember playing Pokemon before I could understand the concepts of stats, EVs, and IVs. All of these formats have essentially been with me for the entirety of my life.1 Their existence has never been in question. I have never entered a stage of my life where I doubted the continuity of Pokemon. Like anyone, I get excited when I hear about new entries in series. I’m excited about the new Metroid Prime. I get the news and I think about how much fun I had with the first trilogy and I realize that the door has opened for more good times. At the same time, however, I realize there to be a limit in what impact this will have on me. Case in point: Breath of the Wild.2 It is an amazing game, undoubtedly. It took the Zelda series in a totally new direction in terms of scope and physics. It plays great. There is not much to complain about in terms of gameplay. But there was no story. I’m exaggerating here. Yes, there was an ultimate battle with Ganon at the end. Yes, you had to save Zelda. There was some semblance of a plot leading up to these events. This is how it’s always been with Zelda, and it’s probably how it’ll always be. That’s where the problem is. The first time I saw the character model for Zelda in Breath of the Wild (the one that looks like she knows how to ride a horse, not the princess one) I was really intrigued by the design. It appeared as if there would be a completely new take on Zelda, an independent Zelda who knew how to survive off the land, a Zelda that did not have to rely on Link to save her. That’s about as far as it went: appearing self-sufficient, not being self-sufficient. During the course of the game she was still portrayed as powerless. Her prayers went unanswered. Her father dictated her activities. Link constantly had to hover over her. Same old Zelda as before. It is very disappointing that Nintendo missed an opportunity to take a classic damsel in distress and turn her into a modern model for women. This is part of the problem though. They’ve developed this premise that’s been proven, and no one will challenge it. All the Zelda games have sold well. They’ve followed similar plot structures. It is a guaranteed cash return. And, to a certain extent, it will be the same as it continues into the future. This isn’t a Zelda issue. It’s an “everything” issue. This is a pervasive condition across all media. You don’t even have to look past the titles to see this. How many of those protagonists are characters that have been newly developed within the past ten years? How many of those stories happen in a new universe? How many of these films come with designs that we are truly unfamiliar with? Will they always be “the” superheroes of any era? Of those ten movies, only four of them do not rely on previously recognizable figures. I would argue that two of those four, Rogue One and Fantastic Beasts, while they don’t have a familiar protagonist, they rely so heavily on an established universe that they might as well be considered media relying on a recognizable figure, the figures being Star Wars and Harry Potter. The other two, Zootopia and The Secret Life of Pets, do not have previously established characters, but they are kid’s movies, and if someone didn’t know better they would guess them to be Pixar or Dreamworks animation films—the point here being that they are delivered in formats that are not new and that can be easily mixed up with an established studio’s work. So, that’s anywhere from six to ten of the top ten grossing movies in the US coming from very safe places, safe brands that people have abided by in the past and will continue to abide by (depending on how many you count here). Alright, if you stretch it, that’s maybe three movies that are relying on recognizable figures. The Spy Who Loved Me, obviously a James Bond film. Annie Hall: Woody Allen was an established comedian at this point in the 70s and maybe the audience could be accused of flocking to that movie because he starred in it.4 And maybe Smokey and the Bandit was a hit for similar reasons; Burt Reynolds was very popular back then. That’s a pretty stark difference between now and forty years ago. Let me say, also, that in no way am I using the top grossing movies as a measurement of the quality of movies that are released during a time period. Simply because a movie did well in an economic sense does not mean it is a good movie. The same goes for music. I’m using the top grossing movies as a measurement of people’s priorities for each time period. From these listings I hope one can see that we (in the US, at least) are relying much more on familiarity now than we were back then. This is not inherently bad or good, but there are implications to it. I’ll get to the implications in a moment. Star Wars was a groundbreaking movie for its time. The introduction of a space opera to cinema had never been done like Star Wars did it. People were not familiar with the concept of light speed. They’d never encountered something like the planet-destroying Death Star. They’d never seen the incandescent combat of light sabers. But one of the more amazing parts of Star Wars, especially when considering our own time period, is that someone gave it a chance. Someone had to budget that movie, which probably took more bravery than one would initially think. There was no precedent for a film like this, and it was expensive for the time. But without taking that chance, people would not have been introduced to all the new ideas I brought up earlier. I do admire this atmosphere, but how far have we come since this duel? Let’s get back to those implications I mentioned. It’s debatable whether or not the reliance on familiarity is producing inferior art now, but, given the public’s tendency to flock to sequels and reboots, let me ask: do you think in the modern environment that something equatable with Star Wars could be produced? In gaming, TV, and movies is there a decent possibility of us being introduced to a new universe that could better than Star Wars? With the evidence presented this seems unlikely. In order for us to have another “Star Wars,” then Star Wars would have to step out of the way. Some might argue that there isn’t a need for new universes right now. It’s reasonable to say that that many of these universes—Star Wars, Assassin’s Creed, Marvel, James Bond, Disney stuff in general—still have spaces to explore. There are existing characters that could be developed more. New characters can be introduced in these universes to change their dynamic. All of this is true, but let me present a scenario that’s been troubling me. At first glance, that might not seem problematic, but what is differentiating one generation from the next? Do you get a sense that each generation is building off of the other, or are they simply recycling products that will lead to similar existences? Is there a possibility for real generational improvement in this scenario? Do any of these generations have an identity? I like that The Matrix came out during my lifetime. I like that my generation has The Wire. These are very strong works that can be associated with the era and the people who lived in it. However, If we continue to produce the same sort of work then one generation will just blend into the next and we will cut ourselves off from something important: new perspectives. If someone had said no to the development of the Mass Effect games because they thought it would be better to produce a Star Wars game with a predictable and dependable revenue, then we would have never been introduced to a game where the alien races are fleshed out and not just sitting idly in the background. If someone had opted to make another Superman movie instead of The Matrix then we wouldn’t have been introduced to a movie that outlines the limitation of our senses. The list for these “What ifs” is extremely long; I hope you get the idea of this. It was the ingenuity of those movies and games, their freedom to break away from familiar storylines that made them so impactful. Audiences were blindsided by them because they’d never seen anything like them before. Part of this probably has to do with the absence of expectations. No one expected The Matrix to be great because no one knew what it consisted of. Nowadays nothing can be released without expectations because every “new” release is built off of a previous release. Will any live-action picture ever compare to this imagery? I don’t know if one can work within a preexisting premise and a make something better than the original entry. Take a look at most of the responses to reboots. How often are they better than original? How many reboots are groundbreaking? Have any of the Alien movies been better than the first? It would appear that there’s a ceiling above the potential in regards to familiar premises. If that’s the case, then we shouldn’t settle for that limitation. We should be trying to produce the most creative pieces of art possible. We should be supporting the most creative pieces of art possible. So, if you’re tired of all the recycling, if you’re tired of all the familiar premises, what do you do about it? If you’re not producing art of your own, what impact do you hope to have? This is probably the hardest part of it all. You can’t say “Stop it.” Your voice just gets drowned out by all the other internet noise. And if you tell someone to “Stop it” have you ever noticed how they turn around and do the opposite? I really don’t want to tell anyone to “Stop it.5” If someone enjoys what the video game industry and the movie industry are producing, then by all means continue to support it. But if you’re tired, what do you do? As sad and meager as it sounds, all you can do is not support it. If you sense that these developers and studios are trying to entice you in a lazy fashion by presenting familiar faces and titles then just don’t support it at all. Don’t pay for the ticket because you’re curious to see how bad it is. Don’t watch the trailer tens of times because you can’t believe how absurd it is. All the tickets, the hits, the likes, the posts, they add up to information, information telling the studios and developers that there’s “buzz” around their product, that people are interested. If something is not worth your time then don’t give it any. And if something new does come along, something you haven’t seen before, something that shows a trace of promise, then support it. Show that you want more premises you haven’t seen before. Show that you want a plot arc that deviates from the usual. There are going to be some duds, assuredly. The whole point of this is to take a chance. It is only through the experimental that we can ever hope to produce something innovative, and, as with all experiments, there will be failures. This is OK. Haven’t you ever seen a movie that was not so great but had a very strong and impactful scene in it? Haven’t you played a game with a bad story but had good mechanics, or vice versa? These little breakthroughs live on in other works. Artists pick up on them and that’s how we end up with masterpieces: taking ideas that worked from as many places as possible and coalescing them into a different interpretation. This might seem hopeless though. So much of American production, not just the artwork, is based in predictable returns, familiarity dominating the market. These sequels, remasters, reboots, they’re hard to ignore. We had such good times with these products; how can we just dismiss them? We’re completionists. We have to complete our collection. We have to own each game in a series. Maybe that’s alright, but we have to support the next generation. We have to support something that can be better than what we experienced. We have to try, right? 1. Full House did go away before it came back. But the “sitcom” has never gone away. The statement about going away was more about the format, and sitcoms all follow the same format. Does anyone really think there’s new ground to be broken in the sitcom format? Is it still something we’re exploring? Or is it just a tradition that we are indefinitely going to carry into the future? And, as a side question, isn’t the format of a sitcom a really sad thing? I mean, an audience that’s there to laugh at all the appropriate times, as if this show is built to tell you when to laugh. Doesn’t it seem like these people are added for the all the lonely viewers out there, someone who needs someone else to laugh? Isn’t this a format that panders to isolated individuals who wish they had more people to laugh with them? 2. Most of my articles have referenced this game. I really need to get out and play more video games so I have something else to talk about—yes, that did sound oxymoronic. 3. I realize that Zelda did actually help Link at the end of Breath of the Wild, but this was an extremely limited role. She supplied him with the light bow and she sealed away Ganon, but she really didn’t do any work. She just kinda prayed. While Link does all this hard labor and combat, Zelda just fold her hands and light starts pouring out of her. If this teaches anything, it’s that women should be supportive, but not leading. Zelda will never lead, and this is my ultimate problem with her and the series. 4. Really, no matter who Woody Allen plays, he’s going to be Woody Allen. He is, for all intents and purposes, an established protagonist. 5. I don’t want to tell anyone to do anything. I don’t want to come across as preachy, but during the course of this paragraph I am giving all this advice of what to do, which is preachy, which makes me hypocritical, which makes sick of myself. I can’t devise a better way to say this though. It’s the best I can do and it is very lame. So, when does a statement stop being advice and start becoming preachy crap? I really don’t know.